To get the most out of your experience, you'll need to log in with a personal account. 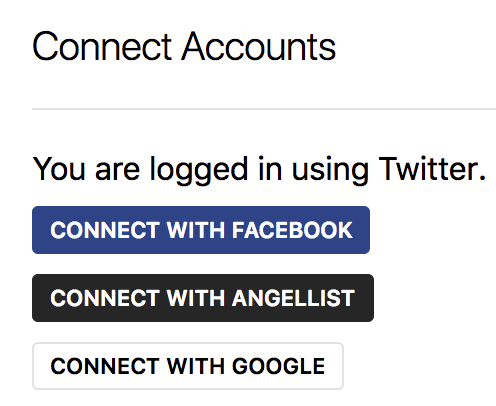 You can use Twitter, Facebook, Gmail, or AngelList to log in. If you'd like, you can connect any of these to your current account at any time at the top of your Settings page. If you're looking for your next favorite product, you've come to the right place! The best place to begin, is the Homepage. There, you'll see the posts that have gotten the most attention from the community for that particular day. The homepage refreshes everyday at midnight PST so be sure to check back to see new posts! If you find a post that catches your eye, you can upvote it, leave a comment, or add it to a collection. Selecting the button on the right will upvote. Selecting the 'Save' button on the left will let you add the post to a collection. We do have a few guidelines when it comes to commenting that you can check out here. If you're looking for a particular type of product, you can use Topics or the search bar at the top of the homepage to help you find what you're looking for. You can also ask the community to recommend some products by using Ask. If you'd like to see what Makers in the community are currently building, you can check out the Upcoming Products and subscribe to get updates on the product from the Maker. Looking for a new job? You can search through our Jobs directory to see if you find a match. The Product Hunt community is global. If you're interested in meeting up with others IRL, check out our Events section to see if there's something near you (or just in a location you've always wanted to visit). If you have a product that you'd love to post (or hunt as we like to say) and share with the community, you can follow our guide on launching! After you've posted, be sure to kick off the conversation with a comment. Feel free to share a direct link to your post on social media to let others know that your product is now live. If you're currently working on a product, be sure to check out Ship and the Shipping section next. Ship is a toolkit for makers to ship awesome products. Using Ship, you can create an Upcoming page to let users get some quick info about the product you're building, and give them the opportunity to subscribe to updates from you. We have a guide available for setting up an Upcoming page that walks through each step of the process. Upcoming pages and post pages are separate so whenever your product is ready to launch, you can follow the information in the posting section to create a post page. For any other questions, feel free to reach out to the Product Hunt team. We're always happy to help!